The SPCA announced the launch of the Catsnip Program,the first of its kind ever in Bermuda. As the name CatSnip suggests – it is a Cat Spay/Neuter/Identify Program. This multi-phase program will start with “Chip Chip Hooray” which is effective immediately. This involves getting all cats,with an identifiable owner, microchipped so that they can be permanently identified. 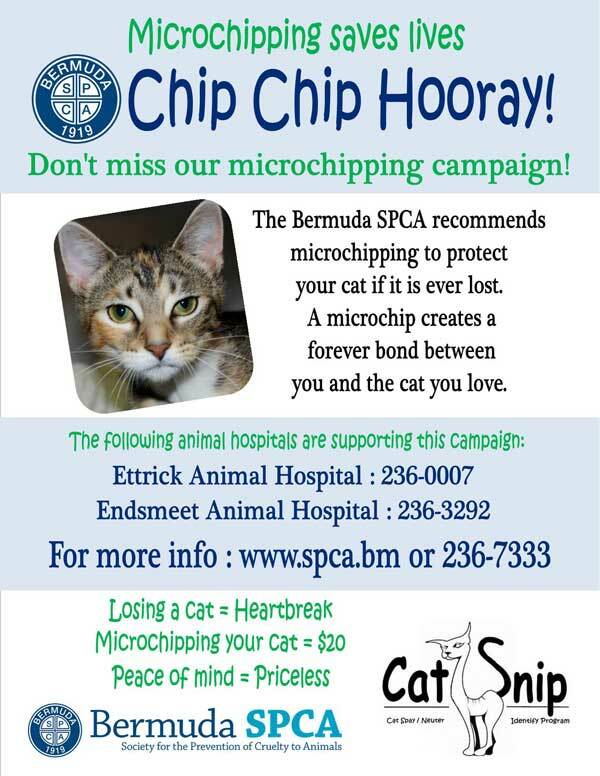 Cat overpopulation is a very serious problem in Bermuda, so the SPCA are being proactive and are introducing this inexpensive way for all cat owners to have their cat[s] microchipped. The next phase of the program, which will be the spay/neuter of owned cats, will be announced in the coming weeks. The SPCA is offering this microchipping at a cost of only $20, which is less than half of what it would normally cost. The microchip procedure is quick and easy and the SPCA is offering this at either of the animal hospitals who support this campaign, Ettrick Animal Hospital or Ends meet Animal Hospital. Both of these Hospitals have agreed to do the microchipping at no cost to the SPCA therefore enabling the full $20 to be put straight into the Cat Snip program to help offset the cost of the chip and to help fund the second phase of the program. A spokesperson said, “The SPCA believes this is long overdue for cats in Bermuda [it has already been in place for dogs for many years, and the SPCA has been microchipping all of its animals for over ten years] and we encourage all cat owners to take us up on this offer as soon as possible. Finally, decent measures are being taken to coral this overpopulated species on this island. Being the dog owner that I am, I for one am extremly excited that a leash is finally being put on cats!